Welcome to the start of a new week! 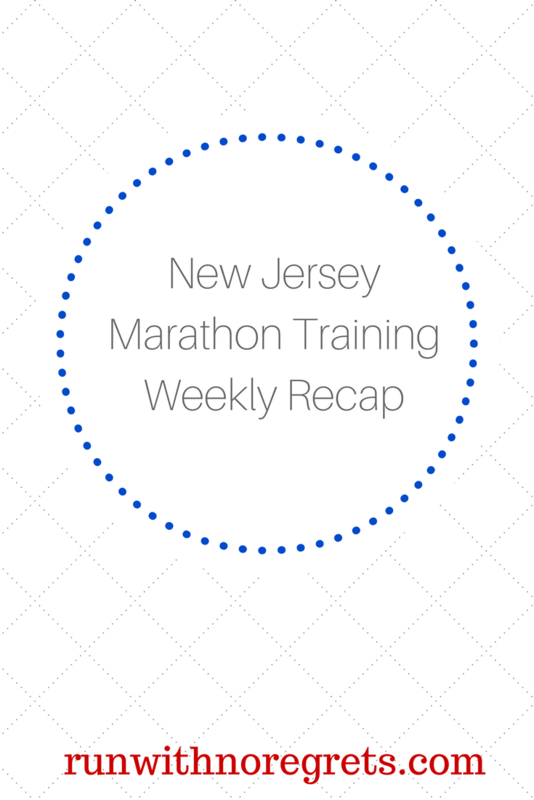 I’m excited to share how my New Jersey Marathon training has gone these past 2 weeks! Now that I’m in a new race training cycle, I’ll be back to posting weekly training recaps. Because of the holidays and all of the New Year posts from last week, I’m sharing 2 weeks of training. Keep reading to check out how it went! I’m joining HoHo and Wendy for the Weekly Wrap – it’s always great to see what my fellow running/fitness friends are up to! I’m also joining Marcia, Patty, and Erika for Tuesdays on the Run, Nicole and AnnMarie for Wild Workout Wednesday, and Rachel, Debbie, and Lora for Running Coaches Corner! This is my first Weekly Wrap of 2018 and it’s great to be back! First I want to say farewell to the wonderful Tricia of MissSippiPiddlin who has stepped down from co-hosting duties. I’ve really enjoyed following her running adventures with her husband and friends! The new co-host is Wendy from Taking the Long Way Home, and I think she knows that I’m a huge fan of hers! Go check out her inspiring blog! So what’s been going on with me since Christmas week? By the way, I hope you had a wonderful holiday season with your family and loved ones. I had a pretty nice, low-key holiday in Philadelphia. Since then, I’ve been busy visiting wedding venues (still haven’t made a final decision yet!) and working on my 2018 goals – a lot of that including becoming a more efficient and productive blogger. Hopefully, you’ll notice some improvements around here soon! But the big story has been the weather….OMG. I am from Buffalo, New York, but this weather is ridiculous even by my standards! Hanging out in the single digits is ROUGH. We had a snow storm in the middle of the week and thanks to the nature of my job, I don’t get snow days! At least the drives to work were quicker than usual since everyone else had days off! Most folks who read here know that I love winter running, so I wasn’t going to let this cold weather stop me, especially since I’m at the beginning of New Jersey Marathon training. I’m on an 18-week schedule and once again working with Coach Laura, and it feels great to be back at it! Remember, you can sign up with a $5 discount for any distance with code: “NJMBibrave18”! Monday 12/25: 3 miles on Christmas Day with Bret! We went for an easy run around the neighborhood and I dressed up with some holiday socks and antlers. Unfortunately, the wind was so ridiculous, I had to carry the antlers in my hand since it kept trying to fly off my head! Tuesday 12/26: 8-mile long run – I was originally going to do my 4-mile progression run but since it was SO cold outside, I figured we should just keep going! This was a really tough, really hilly, miserable run…but I’m glad that I was able to do it without walking. I definitely made the right call to do my long run early in the week! Wednesday 12/27: Yoga and barre fusion class in the evening. My calves were finally starting to feel better after a challenging barre class on Sunday morning. I couldn’t slouch in either the yoga or barre portions of the class – a great workout! Thursday 12/28: Finally my calves are starting to feel normal! No workouts. Friday 12/29: 4 mile easy run in the morning on my day off. The temperature was down to 15 degrees…brrr! I was really glad to get this run done! Saturday 12/30: Another 3 mile run with Bret. We ended up running through the Chresheim Trail and it was so scenic and fun to run through the snowy woods! My first day of training was on Christmas Day and we had a ridiculous cold weather snap…and yet, I still got in all my runs. I’m proud that I was able to resist temptation and get out there! I’m giving my first week of training an A! Monday 1/1: I went to the first barre class of the new year. It was a full house and Megan really kicked our butts! We did pistol squats against the wall at the barre and it was just impossible. Lots of hip work, leg raises, all that fun stuff. I had a really great time in class! Tuesday 1/2: Speed work! Fartlek run: 10 minute warm up, 6 x 2 minutes of easy, 2 minutes hard, then finish up to 4 miles. I felt really good on this run for some reason, even with the warmup. I really pushed myself on the fartleks but remembered to focus on effort instead of pace, since the first one was at an 8:35 pace (a little too fast!). The cold air at night was a little rough though! Wednesday 1/3: I mixed up my schedule and was dressed for a yoga class that was already canceled. No workouts. Thursday 1/4: We had another snow storm! The winds were awful. I was originally going to run outside that day but since I got home late…it wasn’t worth it. No workouts. Friday 1/5: I had to bite the bullet and run on the treadmill. 4 of the most boring miles that I’ve run in quite some time! Saturday 1/6: I was debating that morning in bed whether I wanted to run the 10 miles on Saturday or switch to Sunday. I decided that the -14 wind chill wasn’t the smartest idea, so I went to HIIT Barre at 8 am. We had an awesome workout that effectively killed me, lol. Then shortly after class I went back outside and went for a 2-mile run! It was REALLY cold, but not as bad as I thought it would be! Sunday 1/7: 10 mile run to the Wissahickon! What an amazing run. I was able to run with Ellen, my new running buddy who lives in my neighborhood that I met at barre class. She was so great to run with and she definitely encouraged me to pick up the pace. I wish I had more pictures to highlight the beauty that we ran through, but take my word for it. We did nearly 9 miles together, then I finished up the rest on my own. So proud of this run! Even though I didn’t take a yoga class this past week, I’m giving Week 2 an A! The weather really didn’t make it easy, but I went out for runs in the wind and single digit weather on Saturday and Sunday, and I’m just proud that I got it done! Believe me when I say that I’m relieved that a “January Thaw” is on its way! I miss the 20’s and 30’s for real! Are you training for a race this winter? How have you handled running in super COLD conditions? ?